Ever since elementary school my father has tried to push me to become an electrical engineer. At the time when I was transitioning between middle school to high school and high school to college, I already planned to become what my father wanted me to become. One night, I came home from the gym and I could not fall asleep. I was way too nervous about my future and was wondering if I would be happy being an engineer. I started to ask myself questions like “Is my dad really happy about his work?” “Would I be happy working for someone, or will I be happier working for myself?” I right away chose the ladder and decided that engineering is not what I will be pursuing. The hardest part was telling my parents that I no longer wanted to be an engineer. Looking at my father’s disappointed face and my mom’s look of confusion, I told them that I had other plans. I told them that I want to become a cinematographer. Right away, I was being questioned and doubted by both of them. They told me that this is not the right field for me and that I will not become successful. I am sure that a lot of you have had similar issues with your family. After one full year of my parents doubting me and telling me that my dream would not work out, they finally accepted my reality and started living with my choice of becoming a filmmaker. 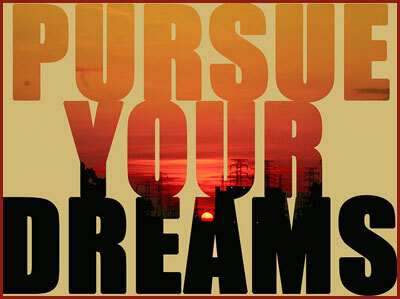 I want to make this perfectly clear guys…If you have a dream, you MUST pursue it. If you can feel it, if you can taste it, if you can DREAM it, you will accomplish it. Keep fighting for what you want and show the nay-sayers who is boss! What You are doing is Wrong!!! Cannot agree more, if you are happy following an interest, then doing it for a living is fun, not work. I think we just invented the 11th commandment- Let there be fun! Find your passion. What you would do everyday for free. Then follow your passion. But don’t follow it wildly. Make a five year business plan. Where do you want to be in 5 years. What do you want to be doing and where do you want to be in 5 years. I was from Tampa, Florida, a relatively unknown town in 1970. It had no football team, no opera house, very little cultural things going on. So my goal was to be nationally known in 5 years. I wanted to be doing photography in New York and making New York day rates but still living in Tampa where I had a large family. I had gone to college for Business and then went to Law School which I had to make that work for me in my new photography career. Then I worked backward on my 5 year plan. If I wanted something in 5 years, what did I have to do today to make that happen? What did I have to do next week, next month, next year, and in two years, and three years for my plan to be successful. There was no Internet, no Social Media, but there were Source Books where Photo Editors looked for photographers. I used my Business and Marketing degree and Law background (which most other photographers did not have) to work for me. I had to make the rounds to Art Directors in New York. So every 6 weeks I did a marketing blitz in New York. I constantly did mail outs. I hired a beautiful assistant to handle my stock photography and to do the daily work. I got several Agents which was not easy. I shot models heat shots and portfolios and weddings to pay the bills in-between the big assignments. I went to New York every two months and personally met with 100 Photo Directors in 10 days. I literally wore out a pair of shows seeing that many Art Directors in that few days. I would hire a limo and driver to be my New York office for those 10 days; and he would make sure I got to my next meeting on time because I did not know New York. I made 3 portfolios of the work that I wanted to do, not the work that I was doing. I did many self imposed assignments. And I bought 3 full pages in 3 different Photography Source books every year. Hard work always pays off. Do what you love and the money will come. I also found Factoring Bank which few non business people know about. In business once your job is complete, a Factoring Bank will buy your invoice for about 90% on the dollar, and collect the remainder less their fee when the client pays in 30 days. I used all the contracts and forms that are in the ASMP contract and business practices books. So I never was waiting for a client to pay me. At 8:AM the next morning after finishing a shoot, my money was wired into my checking account. I was a no body in a cow-town in the South who was doing big time business with the big boys. I’ll say this…dress for success and treat your client with great respect. Dr. Wayne Dyer’s books have some great concepts to live by. “Believe It and you will See” It is a great one. Believe in yourself and try to be the best in your field, and money and success will find you. Good Luck. A big thanks to Josh Morgan, am really inspired by your write ups, thanks, Am taking a step higher in passion of what I love.